You my friend are definately not a true stuck up suit. I just have to give you a little razzin every now and then. No place you'd want to stay for very long! oh what the heck, everybody gets a turn doing this! Will the latrine be the dig-a-deep-hole kind or the JP-8-half-drum kind? If its the former, I have an 9 year-old RL-1 operator and a mini-excavator that we can trailer down. Lets let the boys hand dig it...builds character! I never knew that there were such machines to make doing work easier, until I joined the army. manual labor would be my vote. just let me know if you need a copy of the field san manual. Food for thought. That is not a real deep hole. Not sure on intended duration for use, drainage and soil makeup. If it's just a short term thing it will probably suffice, but for long term I'd want to go deeper. Also if you keep paper products out of it, the natural process is more efficient and effective. Septabs I think is what I put in mine a couple times a year to get it working, probably other variants to do the same. These are not something you want to deal with too many times, I need to redo the original at my cabin this year. No idea how deep it was, 20 years old or so. I'm planning on 4 x 4 x 7-8 deep. Your fields are looking much better now that they are knocked down. Seeing your progress motivated me to finally reclaim some sections of my woods. It was an exciting experience. Random sticks and the base of old stumps being ground up sounded horrible, but no damage was done and the brush cutting continues. You can see how tall the weeds were ahead of the tractor. Now I can actually walk down to the stream in shorts without the stinging pain from nettles! I removed my front end loader so that I could more easily maneuver through the tight trees. You mentioned it became unstable on the side hills, if you are not able to remove the entire FEL, I would highly recommend dropping the bucket off. Removing 100 lbs from the front moves the center of gravity rearward enough that my tractor feels significantly more stable. And I should know, I've nearly tipped the thing over about a half dozen times. When doing loader work I always leave it in 4x4 so that I can steer into it as it starts to lean and accelerate through. I am building a small motocross track with lots of jumps, so that may not be a typical application. 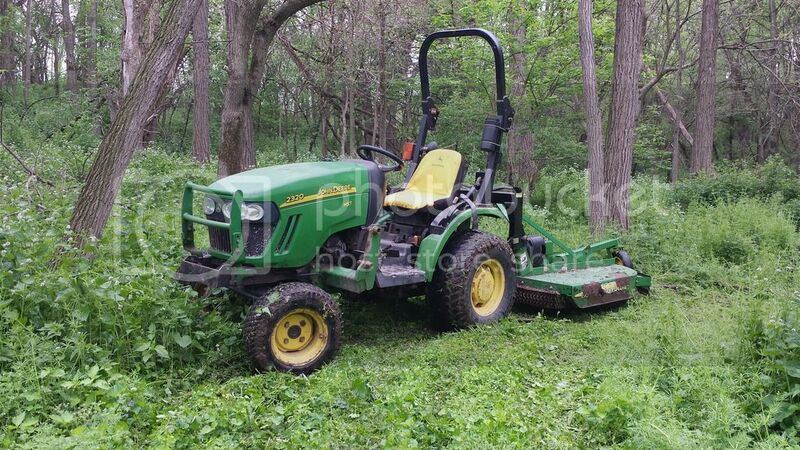 Thanks for the tips on bush hogging. I can remove the FEL easily, although this tractor is significantly larger. It's a 66HP unit. I plan to nug out the bumper on SquareD-ness tomorrow, then drive over to visit with an Amish guy I what to build the shed/workshop for me, then get into the outhouse project on Thursday. I have to agree with Sammconn and go deeper on the outhouse unless you are only planning very limited use and your soil is fantastic draining. They can fill surprisingly fast. I treat mine with a bucket of warm water and some of these http://www.roebic.com/septic-systems.shtml a couple times a summer to help it digest. The ground is too cold here to allow to digest without some help. Look forward to some pictures of the build there. OK the wise men have spoken...go deeper sez the guys in the know. Hey, it's forced labor so who cares how deep it is? How about deep enough so a pre-ranger standing in the bottom can't be seen? Question: Shingles or steel roof? Steel is forever. Shingles are replaceable. If I were t do it again and I did my cabin a couple years ago it would be steel. Now, steel roof in hailstorm is quite loud. Sorry to be so indecisive. Should be able to do all that with two pieces of steel. Oh was planning for one of those light transfer skylight tube things. I actually don't know what it is going to look like. Much the same as the bumper, I just go at it and shape it up as I go. Steel. There is also steel that resembles shingles so sort of a compromise I suppose. Is this going to serve a second purpose, as possibly a hide, with gun ports in all directions, surrounded by these? thought this would be beneficial for your out house construction. Needs a catchy name like in the John Wayne movie, The Green Beret's, Provo's Privy. Do that and I'll stop every time I'm NEAR Kentucky just for some target practice.......unless she's on fire - then I'll just watch! I'd heard stories like that Don. Glad to know they were true! Using these two saws which will be going down to the farm when I get that shed up and cooking. I like the line the Dewalt projects that shows where the cut is about to occur. Working by myself, that took a little while to put together! I probably read it and didn't register in my brain housing group, but you pre-fabbing this then disassembling and trans? Or 100% build then transport? so a couple of questions for yah don. 1. whats the hole size gonna be? 2. why is there a huge hole ripped into your dry wall behind the dewalt miter saw that looks like it is starting to mold? 3. why are there several burn out marks on the floor in your basement? Burn out marks...Well, used to keep a Harley down there. Had to exercise it during the winter months! I'm assuming those are pole structures. You can pour concrete in one/some and have a nice slab, but it's not required... gravel or dirt would be a suitable floor too, if it was mainly used for tool/equipment storage, barn, etc. Or put a basement under a slab. Def going with at least a concrete floor if not a full basement. I don't want it to stand out so a utility building or barn with a living area makes a lot of sense. But then again I am so far back in the middle of somewhere the other side of no where in a county that has fewer people than the average welfare family in Baltimore! Literally we have just over 2,000 in the whole county!